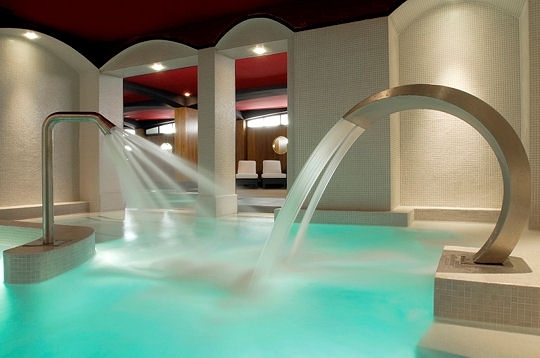 Chlorine (in form of chlorine solution, chlorine tablet, or from electrolysis of salt water) or chlorine compound such as sodium hypochlorite are the most common disinfectant used by pool operators in swimming pools, hydrotherapy pools, spas and jacuzzi. Alone, chlorine is a very reactive gas, which is dangerous to humans. It can affect the nose, throat and lungs if inhaled. However, as a compound it is a cheap disinfectant to be used. Chlorination results into release of harmful substances include bromodichloromethane, chloroform, dibromochloromethane, and bromoform (collectively called trihalomethanes - THMs). THM is a carcinogenic substance formed when chlorine reacts with bodily protein or organic substances present in the water environment. When chlorine reacts with amonia, chloramines are created which produces the distinctive smell ("chlorine-like" smell) and causes sore eyes, irritation and asthma. 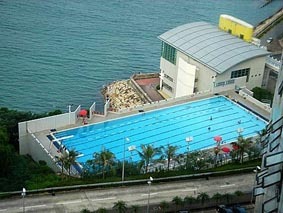 One way of breaking down the chloramines is to shock dose the pool with chlorine. Adding 8 times the usual dosage to the pool at once does this. HydroFLOW P Range is a perfect solution to fix the problem of chloramine. HydroFLOW P Range breaks down chloramines using the induced electric field under the ferrite ring around the pipe. Chloramines are bi-polar molecules, the molecules are formed with bonds that leaves the molecule slightly positive and negatively charged on different ends of the molecule. As opposite charges attract the chloramines molecule will align to the electric field generated by HydroFLOW P Range. These forces stretch the molecule. The stretching force is at it's maximum when the molecule is flowing inside the ferrite ring, causing the bonds to break. The free chlorine doesn't break up though. This is because free chlorine is a unipolar molecule with strong molecular bonds. 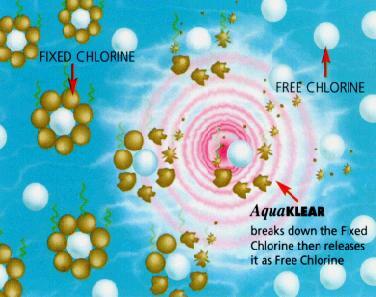 Therefore, the free chlorine is released to become usable free chlorine once more. The remaining parts of chloramines are conductive molecules that are charged by HydroFLOW P Range and are flocculated to other suspended product as described and illustrated below. 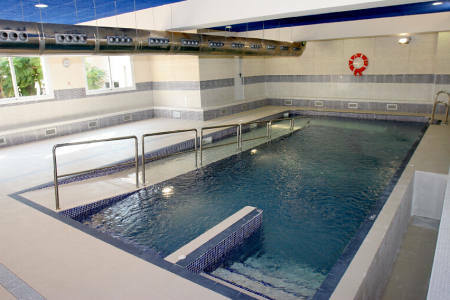 Flocculants such as Alum are used in pools to flocculate solids. This means that small particles clump together forming larger particles. Flocculation makes the filters more effective as it is easier for larger particles to be stopped than it is for tiny ones. HydroFLOW P Range can be installed in any swimming pools, spas, hydrotherapy pools or jacuzzi to prevent the pool users from being threaten by the harmful substance, chloramines and THM. To maximize the performance of HydroFLOW P Range, a sand filter is needed and in fact this is a basic component in water circulation system of those facilities. Copyright © 2015 PowerTech IPC Company Limited. All rights reserved.